It’s over. After months of tents and signs, thousands of police manhours and hundreds of arrests, the Dakota Access Pipeline project is moving forward. 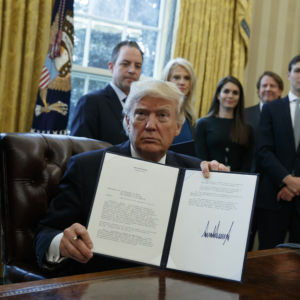 On Tuesday morning, President Donald Trump signed an executive order allowing construction of both the Dakota Access Pipeline and the Keystone XL pipeline to proceed. North Dakota’s congressional delegation greeted the news with relief. Hoeven and North Dakota’s other two members of Congress also hope that federal funding to help cover law enforcement expenses will follow the pipeline approval decision. “The federal delegation and governor are continuing to work together in a bipartisan effort to push for more federal resources for law enforcement,” said Sen. Heidi Heitkamp. Documents from the Morton County Sheriff’s Department show that providing law enforcement for the protests between August 10, 2016 and January 20, 2017 cost the state highway patrol $4.4 million, of which $2.7 million is potentially eligible for reimbursement. Trump’s decision was not altogether unexpected. During the transition period, he met with North Dakota legislators and voiced his support for the project. Despite the setback, native activists and environmental protesters have vowed to continue fighting. The camp’s Medic Healer Council released a second statement, calling the Trump administration’s decision “disheartening but expected” and calling upon it to stop perpetuating “systemic violence” against the protesters. Trump’s approval comes two days after the Standing Rock Tribal Council unanimously passed an evacuation order for the camps. The order would close the main Oceti Sakowin, Rosebud, and Sacred Stone camps within 30 days. In addition, the council voted not to provide temporary shelters to anyone remaining at the camp after a February 19 deadline. During the meeting, tribal representatives voiced their frustration with the protesters, who increasingly interfered with everyday life for area residents. Lawmakers from nearby Cannon Ball, ND have also met to formally condemn the continuation of the camps and to forbid the construction of any permanent camp on the site. The Standing Rock tribe has been pressuring the protesters to remove their camp before spring snowmelt in the coming weeks causes the river to flood. Without appropriate preparation, the river could be contaminated by garbage, debris, and human waste from the water protectors’ camp. The tribe’s actions follow more than a month after North Dakota’s governor announced an emergency evacuation order for the area surrounding the camps as a means of urging people to depart.